Master & Dynamic MW50 review | What Hi-Fi? 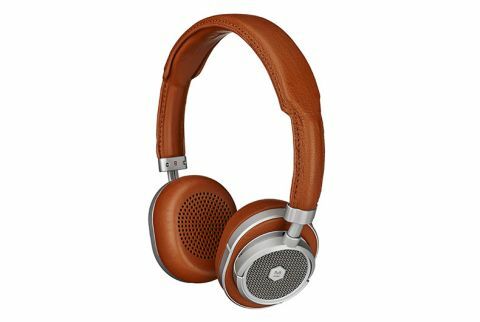 You might think the MW50s by Master & Dynamic are a pair of headphones – but you'd be only partially correct. Their packaging certainly refers to 'wireless on-ear headphones', but delve a little deeper and you'll find the New York-based manufacturer considers the MW50s part of its range of 'sound tools'. Suddenly that price doesn't look so prohibitive, does it? £400 is a fair chunk for wireless on-ear headphones, but may well be a bargain for a 'sound tool'. Who knows? There's very little compromise in the way the MW50s are built and the materials from which they are constructed. Master & Dynamic set it sights squarely at the aspirational/premium end of the market from day one, and to that end the MW50s are built from a very agreeable combination of materials and finished to an unarguably high standard. The metal elements of the frame are built from stainless steel and aluminium. The 40mm drivers are made from beryllium (also beloved of the likes of Focal). The headband exterior and ear-cup accents are covered in heavy-grain cowhide, while the ear-pads and headband interior (which are, of course, your points of contact with the MW50s) are softer lambskin over memory foam. Headband stitching is a) done by hand and b) flawless. So the MW50s look, feel and even smell like an upmarket proposition - they certainly seem built to last. Conceivably we'd like a little more damping to the way the headband adjusts and the ear-cups articulate – the sensation is a little mechanical and ordinary compared to the opulence of the rest of the experience – but that's fairly blatant nitpicking on our part. Features-wise, the MW50s are happy to conform to the norm – and that's an entirely sensible decision. The right ear-cup houses volume up/down and skip-track controls, and also features a USB-C socket for charging the integrated battery and deploying any future firmware updates. On the left, there's a slider for power on/off and Bluetooth pairing, plus a 3.5mm analogue input – the MW50s can be hardwired should the battery run out of juice. That battery is good for a claimed 16 hours of wireless fun from a single charge, and the headphones use aptX Bluetooth 4.1 for the wireless audio profile. The MW50s come complete with a USB-C charging/updating cable and a 1.25m 3.5mm-3.5mm analogue cable. This being Master & Dynamic, of course, both of these cables are heftily braided and finished, and are presented in a little cylindrical leather case. The comfort factor is strong here. The MW50s weigh just 240g, the earcups are compact enough to sit on even the most modest of grown-up ears without alarms, and the headband is grippy without ever becoming uncomfortably so. Opinion is divided as to whether the MW50s' lambskin earpads warm the ears any more noticeably than competing designs, but it's safe to say the MW50s are as painless to use as any on-ear headphones we've encountered. The MW50s wirelessly pair rapidly with all the sources we test them with – a MacBook Air, LG G6 Android smartphone and Apple iPhone X among them – and prove more resistant to extra-curricular smartphone fiddling (we're forever on Twitter, after all) than a few alternatives we could mention. The wireless connection is stable enough to make Master & Dynamic's claim of class-leading signal range – three times that of the industry average, it says – seem plausible. We open modestly enough with a 320kbps Spotify stream of Erland Cooper's Maalie and the MW50s immediately establish themselves as a poised, compact listen. The simple piano phrases and keening strings are loaded with plenty of detail of tone and timbre. The headphones time well enough to make the recording sound like a performance when the drummer shows up and the wordless background vocals start to make their presence felt. Upping the ante a little with a CD-quality Deezer HiFi stream of Richard Dawson's strident Soldier gives the MW50s a chance to show off their midrange fidelity. Dawson's a committed singer, if not the most technically adept, and his vocal is served up with all its character and passion intact. It also serves to show up a slight lack of dynamic headroom. Gallingly ironic, really. When Dawson lets loose and allows his singing to become almost, but not quite, shouting, the MW50s don't have the chops to make the gear-shift as explicit as some rivals can. Rivals which are, let's not forget, without exception less expensive. Redemption of a sort is at hand, though, once we load up a Tidal Masters file of Underworld's Mmm... Skyscraper I Love You. The MW50s lap up the low-frequency action, hitting hard but with obvious control and no little understanding of rhythm and tempo. By the standards of the best alternatives, the MW50s present a fairly small, tight-knit soundstage – but they organise well and there's no danger of instruments or different parts of the frequency range crowding each other out. Again, though, there's a shortage of outright dynamism that makes the tune less abandoned than it should be. When the going gets properly complex, the MW50s don't have as strong a handle on timing as they ought to. Go beyond the lavishness of these headphones as things and there's still plenty to admire. They're expensive for what they are and what they do, but they're not without areas of expertise. They certainly do their best to justify their price in terms of simple tactility. Judged by our strict quality-per-pound criteria, they're a diverting alternative rather than a nailed-on front-runner. But if you want everyone to know you've got big money for headphones, and enjoy a punchy, detailed listen while you do so, by all means give them a listen.